Below: the man on the left is a German medic. Pete Suer, a Jewish dentist/medic is in the middle and Dan McILvoy on the right. Doc McILvoy is offering the German medic a cigarette. War is an author’s favorite subject, but then it mostly relates to generals and fighting men; little is written about the medical aid man and his contribution. The exploits and lives saved by the medics were many and deserve book of their own. Though the general public looks upon medical care in the Armed Forces as a group of doctors working over an operating table, few visualize what goes on from the moment a soldier is wounded until the time he reaches this table. 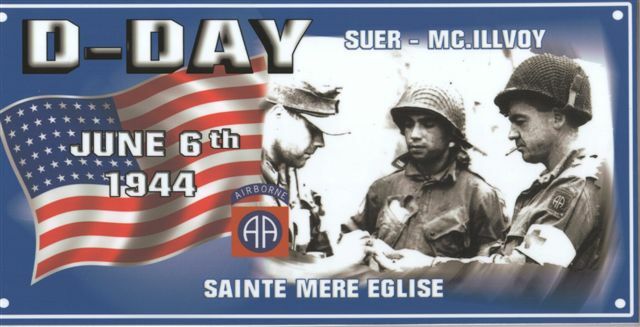 Officers of the 505th Parachute Infantry Regiment have the highest regard for that individual in their unit who took care of the first stages of medical treatment and evacuation: the Parachute Aid Man. Dropped with the men, living under the same adverse and hazardous conditions of war, the aid man does a commendable job. He has a warm, respected place among the parachutists with whom he served. He was affectionately called “Doc”, watched over, fought for in pubs and protected as much as could be in combat. Many a man will tell you how his life was saved by the combat medic. A soldier, if he was not killed outright or wounded so badly that he would not live, became a human challenge. The medic felt like this soldier had every right to live, and his managing to evacuate so many of the casualties was amazing to the medical officers in both Battalion and Regimental Aid Stations. Only by his bravery, were we able to patch up and send back so many mutilated brave paratroopers to the medical teams of surgeons. When combat soldiers in our regiment were awarded the “Combat Infantryman’s Badge” with additional pay, it was noted that the medic did not receive this award, since he was an unarmed combatant and no infantryman. To a medic, a wounded man in need of help calls for action, irrespective of where he may be. The aid man knows the risks involved, he has witnessed fellow aid men killed and wounded, yet he will unhesitatingly and repeatedly take these risks. When subjected to shelling, he must expose himself in order to help the wounded. When there are wounded around him, he knows that keeping down means that someone out there may die. These boys have responsibility over many loves, and they carry it well. To them goes the highest admiration of their medical officers and those who must live or attempt to live in the front lines. While the medics can remember only a few of the parachutists, they can rest assured they are remembered by many. Hundreds of paratroopers remember how the aid man cared for them during the war. The above is part of the dedication from the book "Doc McILvoy and His Parachuting Medics". Most names on the list of medics was obtained from www.allamerican82nd.com. The website is no longer active. 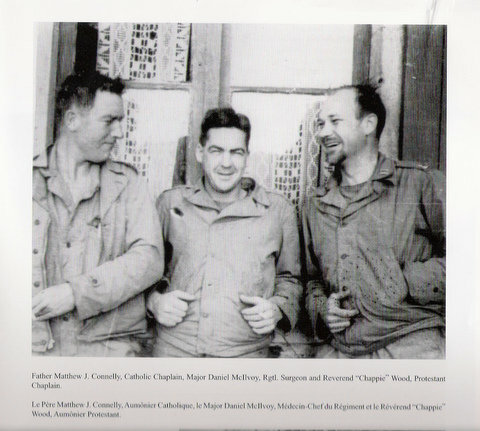 Below left to right; Father Matthew J. Connelly, Catholic Chaplain, Major Daniel McIlvoy, Regimental Surgeon, and Reverend "Chappie" Wood, Protestant Chaplain. According to Doc's daughter Annie, Doc McIlvoy included Father Connelly and Reverend Wood on his personal list of medics, they were so helpful treating the wounded and assisted in burying the Regiments dead. Please contact us at this e-mail address for corrections and additions to the 505th RCT medic list.